Today was the last day for one of my high school first grade NELP students. She's moving to America and I sincerely wish her all the best, though I will miss her. We had a little goodbye party for her in class today..
A couple of first graders 'got the giggles' in NELP class. The second graders attempted to draw a person described in "Getting a Haircut in the Army", a non-fiction piece about a haircut-gone-wrong during the US Civil War. Every day at 16:30, students are welcome to come to the NELP room to study, check out library books, talk and so on. Here are a couple of students using Open Room time to get books. Here are the Junior High 3rd Grade students having a discussion about Chief Seattle's 1854 Oration. Here is my High School 1st Grade Class. 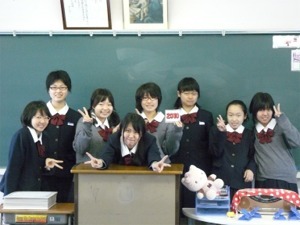 Here the high school first grade class is preparing for their debate. This term, the junior high school third grade students are studying improvisation and extemporaneous speaking for their term project. Today, the students improvised a situation loosely based on Monty Python's famous Parrot Sketch. My only regret was that I didn't film them. They were hysterically funny and gave brilliant performances.